I just returned from a late winter mountaineering trip to Durango, Colorado where snow abounds and the locale’s high-desert-arid ways were seasonally hidden from sight. And though my main focus was simply to make it off of the high peaks in one piece, I couldn’t help but aim my attention to the sheer amount of snow on the ground and, thus, the flowing rivers and creeks all around us. What a stark contrast to the thirsty low deserts of Arizona. And though we are regional neighbors, I suddenly felt what could only be described as an age-old territorial rivalry – that for the single most precious resource on earth –water. So when I returned home, to the warm winter splendor of Tucson, I took note of all of the ways that the Sonoran Desert has prospered from one millennia to the next in the face of sustained climatic harshness. What struck me most, however, was the unfortunate human variable and just how much water we waste every single day in this place that has so little of it to spare. Do we really need to leave the bathroom tap open and free-flowing while we brush our teeth? To add to my already-burgeoning guilt regarding humanity’s lack of natural resource management, the industry in which I work is culpable for some of the most egregious water gaffes of all. Oftentimes, landscapes consume upwards of half of all household water. So what to do about it? Should we live in a world with bone dry and unsightly landscapes? Not at all. Do we need to get rid of grass and swimming pools all together? Definitely not. What really needs to happen is that we must recognize that it's 2016 and technology is on our side. Smart irrigation controllers, systems that monitor water usage, efficient sprinkler systems, access to unique arid-adapted plant material, viable synthetic lawn alternatives and a profusion of water harvesting techniques are readily available and actually quite sophisticated. Now if we could only convince the human race as a whole to catch up to those technological advances – imagine what magnificence could be realized. Ask ten different landscapers how they would install a single irrigation system and you'll get ten different answers. So how is anyone supposed to know how to set up what is essentially, in the desert Southwest, the lifeblood of a landscape? Though it's probably easier to explain what not to do, the following is my number one tip to get you on your way to irrigation mastery. Needless to say, an irrigation system in Tucson, Arizona is a completely different animal than one installed, say in the Midwest. Overhead watering, for anything other than lawns, is not a great idea. Dividing a system into spatial zones (e.g. : front yard, backyard, etc.) also creates problems. And differing plant types sharing the same watering system is wasteful and ill-advised (adjusting just the pressure compensating emitters only accounts for one of the necessary variables). 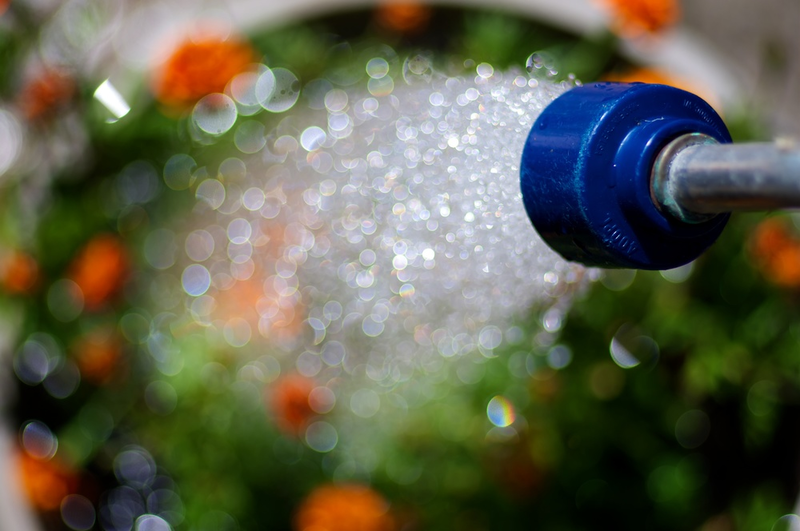 The best way, I’ve found, to organize an irrigation system is to consider each type of plant being watered - a.k.a. : hydrozones. Trees. Shrubs. Cacti and succulents. A vegetable/herb garden. Potted plants. Citrus. Each category of plant material has very distinct water requirements. For example, trees will benefit from deep, infrequent watering while potted plants will want short bursts of moisture multiple times each day. This means that a separate valve assembly (including filter and pressure regulation) will be required for each plant grouping. Weekend Warriors can set this up themselves, though a licensed landscape or irrigation contractor is the safest bet. It’s really not that expensive an endeavor once the benefits come into focus. Just a little extra investment up front pays off in the end. I have to admit that I’m not sure I’d want fake grass in my own backyard. But, in a recent twist of reason, I’ve started to warm up to the notion. Though I couldn’t imagine taking a midday nap in a meadow of green plastic fibers, there are applications that warrant its use. And, no, I’m not talking about a sports field (though that is a worthy usage). If we are serious about cutting our resource consumption…then maybe synthetic lawns deserve a closer, and less disapproving, look. Though synthetic grass can be applied in pretty much any residential setting, it would be best put to use in commercial properties. Not so much at parks and schools where people actively interact with the material, but more like strip malls, shopping centers and office complexes. These are areas that inevitably have lawns that are completely under-utilized and over-maintained. No one is having a picnic or rolling around with a lover at any of these locations. Grass is there because it’s green. But consider the costs. Weekly mowing. Daily watering. Monthly fertilizing. Seasonal over-seeding. Output of fossil fuel emissions. And much of the time the grass looks like hell. Enter synthetic lawns. With a preemptive and initial outlay of money, all of these property management woes disappear. Lawn sprinkler leaks become a thing of the past. Irrigation over-spray on sidewalks is gone forever. Water bills and maintenance costs plummet! And the business property owner is left with a landscape that looks good all year-round. Synthetic turf companies have even made huge advances in the overall appearance of their product. No longer do fake lawns look like Easter egg basket filler. You can now find faux grass varieties with what looks to be natural imperfections and spent blades and most are made of recycled plastics. Now don’t you think that’s worth at least a second glance? Can we all just agree that less material putrefying in landfills across this country would be a good thing? Great. So now that we’ve gotten over that hurdle, we can tackle the big, ugly and almost completely closeted fact that we are essentially being buried in a dearth of debris. There are over thirty-five hundred landfills in this country which, I’ve heard, handle somewhere in the range of two hundred fourteen million tons of solid waste each year. And though some of that is just what you’d think – sullied diapers, gleaming gift wrapping, spent product packaging and the like – quite a bit of the load is green waste – recyclable, compostable and usable material. But what to do with it? The answer is easy – compost. Not only does composting keep otherwise untapped resources out of the trash pile, but it actually puts it to good use. The dark, crumbly, rich material produced from the deliberate breakdown of plant materials like yard debris and kitchen scraps (a.k.a. trash) adds valuable nutrients to hungry soils, improves drainage and even helps to reduce erosion. So why aren’t we all doing it? Maybe it’s because misconception abounds. Though there are headaches often associated with the composting process, it can basically be as user-friendly as you want make it. Composters come in all shapes and sizes and cater to all types of needs. There’s even vermiculture (worm composting) to consider. Why not let the creepy crawlies do all the labor. It works at my house. I haven’t turned a compost bin in years. It really doesn’t matter which method or device you choose. What matters most is that you compost in one form or another. Our plants and soils will be all the healthier for it and, frankly, we might even find ourselves rising to the top of what is fast becoming an ever-burgeoning heap of opportunity.